By Worshipful Ernest Richardson and Brother George E. Schwarzer. As a preamble to the history of Berkshire Lodge, we would like to mention just a few facts which we think should be brought to mind occasionally, and kept on record 'till time shall be no more. Historical facts have a habit of fading into legendary myth. This is brought about by loss, destruction or the failure to keep an accurate account of incidents and occasions, not only for the present, but that they may be clearly and accurately defined a hundred years hence. In this preamble or history of Masonic Lodges in Berkshire County, we have included all available facts. We have also tried to be very brief. Friendship Lodge of Williamstown was the second Lodge to be instituted in Berkshire County. Their Charter was issued July 23, 1785. It was surrendered in 1828, when the anti-Masonic storm clouds began to gather. Franklin Lodge, which originated in Cheshire and which was sometimes referred to as Stafford Hill Lodge because of their meeting place on Stafford Hill, was instituted June 9, 1794. The petitioners, sixteen in number, had requested that they be allowed to sit six months in the Town of Cheshire and six months in the Town of Lanesboro alternately. The Charter was granted, but allowed them to meet only in the Town of Cheshire. However, on June 9, 1800, they again presented their original petition, and this time their prayer was granted, but with the amendment that they alternate every three months instead of every six. Twelve years later, June 9,1812, Franklin Lodge was granted permission, at their request, to move the meeting place from Cheshire to the Town of Windsor in the same County. The members of Franklin Lodge must certainly have had an abundance of that great American desire to seek out new lands and territories. For on the 13th of September, 1813, just a little over a year later, they petitioned Grand Lodge to move Franklin Lodge from Windsor to Adams, South Village, which was the official title of our present day Town of Adams. And what was then called Adams, North Village, is now the City of North Adams. This request was not granted, however, until March 14, 1814. For forty years these hardy pioneers spread the good will and Brotherly Love of Freemasonry throughout Berkshire County, until at last, in the year 1836, they were no more. Exactly why Franklin Lodge closed its doors for good, we do not know. The only logical reason we can think of is the anti-Masonic pressure brought about by the Morgan incident, which is so familiar to us today. Some historians claim that Franklin Lodge never met anywhere but in Cheshire. We discount this claim for the simple reason that the Grand Lodge Proceedings (IV Mass. 33ff) tell us that a group of Master Masons petitioned Grand Lodge for a Charter on September 13, 1826, allowing them to meet in the Town of Adams, South Village. This Charter was denied because Grand Lodge thought that the Town was too small to support two Lodges, and named Franklin Lodge as being Chartered in the Town of Adams at that time. It is our belief that Franklin Lodge unconsciously left the spark that eventually lit the three burning tapers here in our present day Berkshire Lodge. The Charter Members of Berkshire Lodge, being eager to have a True and Perfect Lodge of Master Masons working under their direction, must have realized that if Masonry could exist in the Town of Adams, South Village, in the years preceding 1836, surely the same growing Town could and would be drawn to this wonderful Fraternity in the year 1857 and in the years to come. These men must surely have been ardent Masons, their judgment sound, their efforts sincere, because one hundred years of Masonry must have a firm foundation. And, with this tribute to those men who lived and breathed a hundred years ago, let us once again, figuratively, lay an imaginary corner-stone for the Masonic Temple that Berkshire Lodge has dreamed of in vain, and build a verbal Temple of one hundred years standing, to the memory of those now departed. Our Berkshire Lodge was instituted on November 4, 1857. The Charter Members, seven in number, and guided by Brother Daniel Upton, who became Berkshire Lodge's first Worshipful Master, soon became well known, loved and respected in Masonic affairs. Worshipful Brother Daniel Upton later became Junior Grand Warden of the Most Worshipful Grand Lodge, and to this date, he is the only member of Berkshire Lodge to become a Grand Lodge Officer, District Deputy Grand Master excepted, of course. He was also responsible for the forming of Corinthian Chapter of Royal Arch Masons in Adams, which was instituted on November 6, 1866, and became that Chapter's first High Priest. At the request of several northern Berkshire Master Masons, who realized his abilities as a leader of men, he was persuaded to lay the ground work and the final plans which successfully led to the forming of St. Paul Commandery at North Adams, and remained at its head for many years. Berkshire Lodge was instituted in a building on Park Street, known at that time as the Lapham Block. It is located immediately south of the Congregational Church. These quarters were later occupied by the W. D. Parsons Photographic Studio and even later known as the Gus Smith Studio. Berkshire Lodge continued its activities at this location until October 1869, at which time the members took new quarters in the Collins Block on Center Street over the First National Bank, having the lodge-room on the top floor, with other rooms below. Berkshire Lodge has lived through one Civil War, during which time Lodge activities came almost to a halt because these loyal Americans laid aside the Square and Compasses to don military uniforms; and two conflicts which engulfed most of the civilized world, and has managed to survive the co-related depressions caused by these disturbances of human behavior. In the long past, Berkshire Lodge has been honored with the presence of Grand Lodge Officers on four different occasions: namely, on the day of our Lodge Constitution, on the occasion of our 50th Anniversary celebration, at the dedication of these Masonic rooms in 1916, and now once again at this, our Centennial Anniversary. We trust that every year of its duration will impress upon the hearts and minds of our fellow citizens here in Adams the importance and worth of the great principles for which our Order stands, and also that our people may be brought to feel that their Town is a better Town for the existence of such a Fraternity, and that they may welcome with rejoicing the Centennial Anniversary of Berkshire Lodge, should the rolling years bring us to another half-century milestone in our history. None can say what time may have in store for us, whether bane or blessing, but of this we can rest assured that, "Behind the dim unknown standeth God within the shadow keeping watch above His own!" These were the closing paragraphs of the historical address written and delivered by Right Worshipful George H. Holden at the 50th Anniversary of Berkshire Lodge. Berkshire Lodge has reached another half-century milestone, and today we are assembled here to celebrate the 100th Anniversary of our Lodge. Since November 11, 1907, when our Brethren celebrated the 50th Anniversary, many changes have taken place in the world around us, some good, some bad. Berkshire Lodge has experienced both. A major disaster occurred on April 7, 1915, when the Masonic Apartments were completely destroyed by fire, and for nine months it was necessary for our Brethren to meet at the Odd Fellows' Hall on Park Street. The Worshipful Master of Berkshire Lodge, J. K. Ferguson, appointed a committee, headed by Worshipful Brother S. L. A. Hall, to meet with a committee of Corinthian Chapter, Royal Arch Masons, for consideration of new quarters. At this meeting there was some talk about building a Masonic Temple, but the idea died in the State Armory where it was born. Finally, it was decided to accept the offer of the Greylock and First National Banks to lease the entire top floor of the same building they were driven from a few months before. The committees were empowered to authorize the arrangement of the rooms and to purchase the needed furnishings. With the aid of membership subscriptions, what you see here now is the result of their decision. On January 29, 1916, our new quarters were dedicated. Most Worshipful Melvin M. Johnson and his suite of Grand Lodge Officers honored us with their presence and officiated at the dedication exercises. Three hundred and fifty Masons, including the District Deputy Grand Masters from the 14th, http://masonicgenealogy.com/MediaWiki/index.php?title=MANorthAdams15_1911-1926 15th], 16th, 18th and 33rd Districts, one hundred and twenty members of Berkshire Lodge, and one hundred and thirty-three visiting Brethren were present at this gathering. As there are some interesting events in the life of Berkshire Lodge in which our members are no doubt interested, we would like to mention a number of them briefly. The Visitors' Register of our Lodge bears witness that on October 16, 1862, William D. Coolidge, then the Most Worshipful Grand Master of Masons in Massachusetts, paid Berkshire Lodge an informal visit while traveling through this area. On September 7, 1897, we had the honor of welcoming the 25th President of these United States of America, Brother William McKinley. The President was a guest at the residence of the Honorable William B. Plunkett, and a delegation of Masons from Berkshire Lodge were invited to the Plunkett home to meet our distinguished Brother. On Monday evening, May 4, 1908, at a regular meeting the Worshipful Master announced with deep regret the passing of our oldest Charter Member, Worshipful Horace M. Holmes. According to our records, the jewels were draped for thirty days, as a fitting tribute to his memory. To our knowledge, no other Master Mason has ever been so honored here at Berkshire Lodge. At the regular March meeting in 1916, Worshipful Brother Haskins, presiding Master of Upton Lodge of Cheshire at that time, presented to Berkshire Lodge an Altar Bible in behalf of the members of his Lodge. That Bible still enriches our Altar at this time and opens and closes each and every meeting. Once again, on Sunday, October 8, 1916, Berkshire Lodge was honored with a distinguished guest in the person of Brother William Howard Taft, ex-President of these United States. Brother Taft accepted the invitation of our Lodge to deliver the principal address, entitled "The Ethics of Citizenship," at the Masonic Night Service at the Congregational Church. Eight hundred people were present to hear this address. After the Church Service, Brother Taft was the guest of Berkshire Lodge at a banquet here in these Apartments and was welcomed by about sixty members of Berkshire Lodge. At a special communication held on March 19, 1917, Worshipful David D. Bowen was presented the Henry Price Medal in recognition of his Masonic labors for the fifty years past. It is interesting to note that in those days this Medal was awarded only to Masons who had distinguished themselves for exceptional active service to Freemasonry for at least fifty years. The presentation was made by Worshipful T. D. Brown in behalf of Berkshire Lodge. Saturday, November 24, 1917, saw Berkshire Lodge celebrate its 60th Anniversary. Visitors from all over Berkshire County joined one hundred twenty members and partook of an exceptionally fine banquet tendered by the Ladies of Franklin Chapter, Order of Eastern Star. Brother Guy A. Ham was the guest speaker and his subject, "The Contribution of Masonry to Democracy," was well received and applauded. The only regular communication ever omitted by Berkshire Lodge was that of October 1918. Civil Health Authorities would not allow a public assembly in view of the then existing influenza epidemic. Berkshire Lodge annually observes a Past Masters' Night. This night is especially to honor those Brothers among us who have worked in Lodge long and diligently and who were, by reason of their zeal and fidelity, elected to preside over Berkshire Lodge as its Worshipful Master. The first Past Masters' Night was held in 1904, and will, we all hope, continue to be the huge success we know it to be. In bringing this historical account of Berkshire Lodge to a close, let us leave all of you with this sincere thought. Our Lodge has been blessed throughout its one hundred years of existence with many worthy Brothers, who never in their Masonic career have lost the memory of the underlying reason which prompted them to knock at the West Gate for admission. Because we think of each Brother as "Berkshire Lodge" personified, we say to all of the Brethren here today, and to you whom God has called unto Himself in the Celestial Lodge above, and whose memory we shall always cherish, thank you. Your zeal and fidelity to our gentle Craft has made the dream of observing this Centennial celebration a happy reality. And you may rest assured that we will continue to emulate the example of Friendship, Morality and Brotherly Love which you have so fittingly set before us. As a preamble to the history of Berkshire Lodge, we would like to mention just a few facts which we think should be brought to mind occasionally, and kept on record "till time shall be no more." Historical facts have a habit of fading into legendary myth. This is brought about by the loss, destruction or the failure to keep an accurate account of incidents and occasions, not only for the present, but that they may be clearly and accurately defined a hundred years hence. In this preamble, or History of Masonic Lodges in Berkshire County, we have included all available facts. We have also tried to be very brief. The first lodge in Berkshire County to receive a Charter was Berkshire Lodge No. 5 of Stockbridge. Their Charter was granted on the eighth day of March in 1777. On that very same day our own Most Worshipful Grand Lodge gained its independence, for until that time it had been a Provincial Grand Lodge. Berkshire Lodge No. 5 continued to operate until 1792. After this date there is no record of its proceedings. When or why it ceased to exist, we do not know. Thus, we have the first example of fact fading into legend. (1920:233f) Friendship Lodge of Williamstown was the second Lodge to be instituted in Berkshire County. Their Charter was issued in 1785 on the 23rd of July. It was surrendered in 1828 when the Anti-Masonic storm clouds began to gather. Franklin Lodge, which originated in Cheshire, and which was sometimes referred to as Stafford Hill Lodge because of their meeting place on Stafford Hill, was instituted on June 9th, 1794. The petitioners, sixteen in number, had requested that they be allowed to sit six months in the Town of Cheshire, and six months in the Town of Lanesboro, alternately. The Charter was granted, but allowed them to meet only in the Town of Cheshire. However, on June 9ih in the year 1800, they again presented their original petition, and this time their prayer was granted, but with the amendment that they alternate every three months instead of every six. Twelve years later, June 9th, 1812, Franklin Lodge was granted permission at their request to move the meeting place from Cheshire to the Town of Windsor in the same County. The members of Franklin Lodge must certainly have had an abundance of that great American desire to seek out new lands and territories. For on the 13th of September, 1813, just a little over a year later, they petitioned Grand Lodge to move Franklin Lodge from Windsor to Adams, South Village, which was the official title of our present Town of Adams. And what was then called Adams, North Village, is now the City of North Adams. This request was not granted, however, until March 14, 1814. For forty years these hardy pioneers spread the good will and Brotherly Love of Free-masonry throughout Berkshire County, until at last in the year 1836 they were no more. Exactly why Franklin Lodge closed its doors for good, we do not know. The only logical reason we can think of is the Anti-Masonic pressure brought about by the Morgan incident which is so familiar to us today. Some historians claim that Franklin Lodge never met anywhere but in Cheshire. We discount this claim for the simple reason that the Grand Lodge Proceedings Book of 1826-1844, Page 33, tells us that a group of Master Masons petitioned Grand Lodge for a Charter allowing them to meet in the Town of Adams, South Village, on the 13th of September in 1826. This Charter was denied because Grand Lodge thought that the Town was too small to support two Lodges, and named Franklin Lodge as being Chartered in the Town of Adams at that time. It is our belief that Franklin Lodge unconsciously left the spark that eventually lit the three burning tapers here in our present day Berkshire Lodge. The Charter Members of Berkshire Lodge, being eager to have a True and Perfect Lodge of Master Masons working under their direction, must have realized that if Masonry could exist in the Town of Adams, South Village, in the years preceding 1836, surely the same growing Town could and would be drawn to this wonderful Fraternity in the year 1857 and in the years to come. These men must surely have been ardent Masons, their judgment sound, their efforts sincere, because over 100 years of Masonry must have a firm foundation. And so, with this tribute to those men who lived and breathed a hundred years ago, let us now lay the cornerstone for the Masonic Temple that Berkshire Lodge has dreamed of for over one hundred years to the memory of those now departed. Our Berkshire Lodge was instituted on the 4th day of November in 1857. 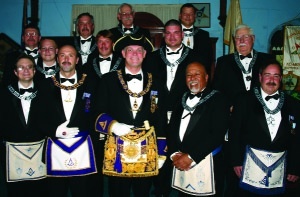 The Charter Members, seven in number, and guided by Brother Daniel Upton who became Berkshire Lodge's first Worshipful Master, soon became well-known, loved and respected in Masonic affairs. Worshipful Brother Daniel Upton later became Junior Grand Warden of the Most Worshipful Grand Lodge at Boston. And to this date he is the only member of Berkshire Lodge to become a Grand Lodge Officer, District Deputy Grand Masters excepted, of course. He was also responsible for the forming of Corinthian Chapter of Royal Arch Masons in Adams, which was instituted on November 6. 1866, and became that Chapter's first High Priest. At the request of several Northern Berkshire Master Masons, who realized his abilities as a leader of men, he was persuaded to lay the ground work and the final plans which successfully led to the forming of St. Paul Commandery at North Adams, Massachusetts, and remained at it for many years. Berkshire Lodge was instituted in a building on Park Street, known at that time as the Lapham Block. It is located immediately south of the Congregational Church. These quarters were later occupied by the W. D. Parsons Photographic Studio and even later known as the Gus Smith Studio. Berkshire Lodge continued its activities at this location until October, 1869, at which time the members took new quarters in the Collins Block on Center Street over the First National Bank, having the Lodge Room on the top floor with other rooms below. Berkshire Lodge has lived through one Civil War, during which time Lodge activities came almost to a halt because these loyal Americans laid aside the Square and Compasses to don military uniforms; and two conflicts which engulfed most of the civilized world, and has managed to survive the co-related depressions caused by these disturbances of human behavior. In the long past, Berkshire Lodge has been honored with the presence of Grand Lodge Officers on four different occasions, namely, on the day of our Lodge Institution, on the occasion of our 50th Anniversary Celebration, at the dedication of these Masonic Rooms in 1916, at our Centennial Anniversary, and now at this grand and glorious occasion, the dedication of our own Masonic Temple. And now to repeat the words of our first historian, let us say: "We trust that every year of its duration will impress upon the hearts and minds of our fellow citizens here in Adams the importance and worth of the great principles for which our order stands, and also that our people may be brought to feel that their Town is a better Town for the existence of such a Fraternity, and that they may welcome with rejoicing the new home of Berkshire Lodge, should the rolling years bring us to another half-century milestone in our history. None can say what time may have in store for us, whether bane or blessing, but of this we can rest assured that, 'Behind the dim unknown standeth God within the shadow keeping watch above His own!' "
Since November 11, 1907, when our Brethren celebrated the 50th Anniversary, many changes have taken place in the world around us. Some good, some bad. Berkshire Lodge has experienced both. A major disaster occurred on April 7, 1915, when the Masonic Apartments were completely destroyed by fire, and for nine months it was necessary for our Brethren to meet at the Odd Fellows' Hall on Park Street. The Worshipful Master of Berkshire Lodge, J. K. Ferguson, appointed a committee headed by Worshipful Brother S. L. A. Hall to meet with a committee of Corinthian Chapter, Royal Arch Masons, for consideration of new quarters. At this meeting there was some talk about building a Masonic Temple, but the idea died in the State Armory where it was born. Finally it was decided to accept the offer of the Greylock and First National Banks to lease the entire top floor of the same building they were driven from a few months before. The committees were empowered to authorize the arrangement of the rooms and to purchase the needed furnishings. With the aid of membership subscriptions, the rooms were equipped and furnished; the building being the property of Greylock and First National Banks. On January 29, 1916, our new quarters were dedicated. Most Worshipful Melvin M. Johnson and his Suite of Grand Lodge Officers honored us with their presence and officiated at the dedication exercises. The Visitors Register of our Lodge bears witness that on October 16, 1862, William D. Coolidge, then the Most Worshipful Grand Master of Masons in Massachusetts, paid Berkshire Lodge an informal visit while traveling through this area. On September 7, 1897, we had the honor of welcoming the 25th President of these United States of America, Brother William McKinley. The President was a guest of Honorable William B. Plunkett at his residence, and a delegation of Masons from Berkshire Lodge were invited to the Plunkett home to meet our distinguished Brother. On Monday evening, May 4, 1908, at a regular meeting, the Worshipful Master announced with deep regret the passing of our oldest Charter Member, Worshipful Brother Horace M. Holmes. According to our records the jewels were draped for thirty days, as a fitting tribute to his memory. To our knowledge, no other Master Mason has ever been so honored here at Berkshire Lodge. Once again on Sunday the eighth day of October 1916, Berkshire Lodge was honored with a distinguished guest in the person of Brother William Howard Taft, ex-President of these United States. Brother Taft accepted the invitation of our Lodge to deliver the principal address, entitled "The Ethics of Citizenship" at the Masonic Night Service at the Congregational Church. Eight hundred people were present to hear this address. After the Church Service, Brother Taft was the guest of Berkshire Lodge at a banquet here in these Apartments and was welcomed by about sixty members of Berkshire Lodge. At a Special Communication held on the nineteenth of March 1917, Worshipful Brother David D. Benson was presented the Henry Price Medal in recognition of his Masonic labors for the fifty years past. It is interesting to note that this medal is only awarded to Masons who have distinguished themselves for exceptional active service to Freemasonry for at least fifty years. The presentation was made by Worshipful Brother T. D. Brown in behalf of Berkshire Lodge. Saturday, November 24, 1917, saw Berkshire Lodge celebrate its 60th Anniversary. Visitors from all over Berkshire County joined one hundred twenty members and partook of an exceptionally fine banquet tendered by the ladies of Franklin Chapter, Order of Eastern Star. Brother Guy A. Ham was the guest speaker and his subject "The Contribution of Masonry to Democracy" was well received and applauded. The only regular Communication ever omitted by Berkshire Lodge was that of October, 1918. Civil Health Authorities would not allow a public assembly in view of the then existing Influenza Epidemic. Berkshire Lodge annually observes a Past Masters' Night. This night is especially to honor those Brothers among us who have worked in Lodge long and diligently and who were by reason of their zeal and fidelity elected to preside over Berkshire Lodge as its Worshipful Master. The first Past Masters' Night was held in 1904, and will, we all hope, continue to be the huge success we know it to be. In bringing this historical account of Berkshire to a close, let us leave all of you with this sincere thought. Our Lodge has been blessed throughout its one hundred eleven years of existence with many worthy Brothers, who never in their Masonic career have lost the memory of the underlying reason which prompted them to knock at the West Gate for admission. In January 1968, we purchased the former Trinity Methodist Church of which we are now holding our dedication. Because we think of each Brother as "Berkshire Lodge" personified, we say to all of the Brethren here today, and to you whom God has called unto Himself in the Celestial Lodge above, and whose memory we shall always cherish, thank you. Your zeal and fidelity to our gentle Craft has made the dream of observing this Dedication Celebration a happy reality. And you may rest assured, that we will continue to emulate the example of Friendship, Morality and Brotherly Love which you have so fittingly set before us. On Saturday, November 2, 1957, Berkshire Lodge celebrated its l00th An- niversary. The Lodge received the Most Worshipful Grand Master, Andrew G. Jenkins and his suite of Grand Lodge officers. Brother George Schwarzer read a history of Berkshire Lodge prepared by him and Worshipful Brother Ernest Richardson for the occasion. After the ceremonies, the assembly proceeded to the Turn Hall where a turkey banquet was enjoyed by all and the Adams Male Glee Club entertained the Brethren. In December of 1959, Worshipful Brother Gilbert E. Loffler was appointed District Deputy Grand Master for the North Adams 15th Masonic District by Most Worshipful Laurence E. Eaton, Grand Master. In December of 1960, Right Worshipful Gilbert E. Loffler was appointed to serve a second year as District Deputy by Most Worshipful Laurence E. Eaton. In 1965, Berkshire Lodge was informed that the building in which the Lodge rooms were occupied on the third floor, was to be demolished for urban renewal. On March 1, 1965, a committee was formed to find new quarters for Berkshire lodge. Serving on this committee were Brother Ralph E. Anthony, Jr. and Worshipful Ftitz H. Koch as Co-Chairmen and Brother Clarence Bugbee, Brother Wilmer Pennington, Brother Harold L. Jones, Brother Bertram James and Brother Clyde J. Horton. The most outstanding event of the last twenty-five years, without a doubt, was the purchase of the former Trinity Methodist Church on Center Street in June of 1967 for our new Lodge rooms. Due to Berkshire Lodge being in the process of moving to its new quarters, a special dispensation was granted to hold our May and June meetings in Cheshire through the courtesy of the Master and members of Upton Lodge. After many months of work by the building and electrical contractors, plus clean-up and painting work bees of the brethren of Berkshire lodge, our new quarters were ready. The first meeting in our new Lodge rooms was held on September 9, 1968. Dedication ceremonies for our new Berkshire Lodge rooms were held on October 26, 1968, under the direction of Most Worshipful Thomas Arnold Booth, Grand Master. The Most Worshipful Grand Master arrived with two of his aides and they were greeted at the door by Worshipful Edwin Luczynski, Master of Berkshire lodge. An informal gathering was then held in the lodge rooms where members of Berkshire lodge were introduced to the Grand Master and members of his suite. After the Grand Master unveiled the new corner stone, which was cut and installed in the corner by Brother Gerard Peloquin of Mt. Tom Lodge in Holyoke, who presented it to Berkshire Lodge without cost, the new temple was dedicated in full form and ceremony. When the ceremony was concluded, Most Worshipful Brother Booth spoke to the members of Berkshire Lodge and visiting dignitaries. He praised the members and friends of Berkshire todge on their efforts to bring about what he called a beautiful temple. In December of 1969, Worshipful Harold L. Jones was appointed District Deputy Grand Master for the North Adams 15th Masonic District by Most Wor￼shipful Herbert H. Jaynes, Grand Master. He was reappointed by Most Worshipful Jaynes to serve a second year in December of 1970. Right Worshipful Gilbert E. Loffler was awarded the Joseph Warren Medal by Most Worshipful Herbert H. Jaynes and it was presented to him on May 4, 1970 by Right Worshipful Harold L. Jones. Worshipful Brother Fritz H. Koch was awarded the Joseph Warren Medal by Most Worshipful Herbert H. Jaynes and it was presented to him on March 6, 1972 by Right Worshipful Harold R. Amato. Brother Jacob Wineberg was awarded the Joseph Warren Medal for service to Berkshire Lodge and the community by Most Worshipful Arthur H. Melanson and it was presented to him on August 25,1979 by Right Worshipful Norman W. Miller at the installation of officers for the 1979-1980 season. Worshipful Fritz H. Koch was appointed District Deputy Grand Master for the North Adams 15th Masonic District in December of 1979, by Most Worshipful Arthur H. Melanson, Grand Master. He was reappointed by Most Worshipful J. Philip Berquist to serve a second year in December of 1980. In the long past, Berkshire lodge has been honored with the presence of Grand Lodge Officers on five different occasions, namely, on the day of our lodge Institution, on the occasion of our 50th Anniversary Celebration, at the dedication of these Masonic Rooms in 1916, at our centennial Anniversary, the dedication of our own Masonic Temple in 1968, and now at this grand and glorious occasion, our 125th Anniversary. In bringing this historical account of Berkshire Lodge to a close let us leave all of you with this sincere thought. Our todge has been blessed throughout its one hundred and twenty-five years of existence with many worthy Brothers, who never in their Masonic careers have lost the memory of the underlying reason which prompted them to knock at the West Gate for admission. Because we think of each Brother as "Berkshire Lodge" personified, we say to all of the Brethren here today, and to you whom God has called unto Himself in the Celestial lodge above, and whose memory we shall always cherish, thank you. Your zeal and fidelity to our gentle Craft has made the dream of observing this Anniversary Celebration a happy reality. You may rest assured, that we will continue to emulate the example of Friendship, Morality and Brotherly Love which you have so fittingly set before us. As a preamble to the history of Berkshire Lodge, we would like to mention just a few facts which we think should be brought to mind occasionally, and kept on record `til time shall be no more. Historical facts have the habit of fading into legendary myth. This is brought about by the loss, destruction or the failure to keep an accurate account of incidents and occasion, not only for the present, but that they may be clearly and accurately defined a hundred years hence. Friendship Lodge of Williamstown was the second lodge to be instituted in Berkshire County. Their Charter was issued in 1785 on the 23rd day of July. It was surrendered in 1828 when the Masonic storm clouds began to gather. Franklin Lodge, which originated in Cheshire, and which was sometimes referred to as Stafford Hill Lodge because of their meeting place on Stafford Hill, was instituted on June 9, 1794. The petitioners, sixteen in number, had requested that they be allowed to sit six months in the town of Cheshire, and six months in the town of Lanesboro, alternately. The Charter was granted, but allowed them to meet only in the town of Cheshire. However, on June 9th in the year 1800, they again presented their original petition, and this time their prayer was granted, but with the amendment that they alternate every three months instead of every six. Twelve years later, June 9, 1812, Franklin Lodge was granted permission, at their request, to move the meeting place from Cheshire to the town of Windsor in the same County. The members of Franklin Lodge must certainly have had an abundance of that great American desire to seek out new lands and territories. On the 13th of September 1813, just a little over a year later, they petitioned Grand Lodge to move Franklin Lodge from Windsor to Adams, South Village, which was the official title of our present town of Adams. What was then called Adams, North Village, is now the city of North Adams. This request was not granted, however, until March 14, 1814. For forty years these hardy pioneers spread the good will and brotherly love of Freemasonry throughout Berkshire County. In the year 1836, they were no more. Exactly why Franklin Lodge closed its doors for good, we do not know. The only logical reason we can think of is the anti-Masonic pressure brought about by the Morgan Affair. Some historians claim that Franklin Lodge never met anywhere but in Cheshire. We discount this claim for the simple reason that the Grand Lodge proceedings of 1826 -1844, page 33, tells us that a group of Master Masons petitioned Grand Lodge for a Charter allowing them to meet in the Town of Adams, South Village, on the 13th of September 1826. This Charter was denied because Grand Lodge thought that the town was too small to support two lodges, and named Franklin Lodge as being chartered in the town of Adams at that time. The Charter Members of Berkshire Lodge, being eager to have a True and Perfect Lodge of Master Masons working under their direction, must have realized that if Masonry could exist in the Town of Adams, South Village, in the years preceding 1836, surely the same growing town could and would be drawn to this wonderful Fraternity in the year 1857 and in the years to come. These men must surely have been ardent Masons, their judgment sound, their efforts sincere, because over 150 years of Masonry must have a firm foundation. With this celebration let us now dedicate one hundred and fifty years of Brotherly Love, Relief and Truth to those men who lived and breathed one hundred and fifty years ago. Let us never forget our brothers now departed. Our Berkshire Lodge was instituted on the 4th day of November in 1857. The Charter Members, seven in number, and guided by Brother Daniel Upton who became Berkshire Lodge’s first Worshipful Master, soon became well known, loved and respected in Masonic affairs. Worshipful Brother Daniel Upton later became Junior Grand Warden of the Most Worshipful Grand Lodge at Boston. To this date he is the only member of Berkshire Lodge to become a Grand Lodge Officer, with the exception of District Deputy Grand Masters, of course. He was also responsible for the forming of Corinthian Chapter of Royal Arch Masons in Adams, which was instituted on November 6, 1866, and he became that Chapter’s first High Priest. At the request of several Northern Berkshire Master Masons, who realized his abilities as a leader of men, he was persuaded to lay the ground work and the final plans which successfully led to the forming of St. Paul Commandery at North Adams, Massachusetts, and he remained at its head for many years. Berkshire Lodge was instituted in a building on Park Street, known at that time as the Lapham Block. It is located immediately south of the Congregational Church. These quarters were later occupied by the W. D. Parsons Photographic Studio and even later known as the Gus Smith Studio. Berkshire Lodge continued its activities at this location until October 1869, at which time the members took new quarters in the Collins Block on Center Street over the First National Bank, having the Lodge Room on the top floor, with other rooms below. Berkshire Lodge has lived through the Civil War, during which time Lodge activities came almost to a halt because these loyal Americans laid aside the Square and Compasses to don military uniforms. In the long past Berkshire Lodge has been honored with the presence of Grand Lodge Officers on five different occasions, namely, on the day of our Lodge Institution, on the occasion of our 50th Anniversary Celebration, at the dedication of the Masonic Rooms in the Collins Block in 1916, at our Centennial Anniversary, at our Dedication Ceremony of our present day building in 1968, and now at this grand and glorious occasion as we celebrate our One Hundred and Fiftieth Anniversary. Since November 11, 1907, when our brethren celebrated the 50th Anniversary, many changes have taken place in the world around us: some good and some bad. Berkshire Lodge has experienced both. A major disaster occurred on April 7, 1915, when the Masonic Apartments were completely destroyed by fire, and for nine months it was necessary for our brethren to meet at the Odd Fellows’ Hall on Park Street. The Worshipful Master of Berkshire Lodge, J.K. Ferguson, appointed a committee headed by Worshipful Brother S. L. A. Hall to meet with a committee of Corinthian Chapter, Royal Arch Masons for consideration of new quarters. At this meeting there was some talk about building a Masonic Temple, but the idea died in the State Armory where it was born. Finally it was decided to accept the offer of the Greylock and First National Banks to lease the entire top floor of the same building that they were driven from a few months before. The committees were empowered to authorize the arrangement to the rooms and to purchase the needed furnishings. With the aid of membership subscriptions, the rooms were equipped and furnished, the building being property of Greylock and First National Banks. On January 29, 1916, our new quarters were dedicated. Most Worshipful Melvin M. Johnson and his suite of Grand Lodge Officers honored us with their presence and officiated at the dedication exercises. On September 7, 1897, we had the honor of welcoming the 25th President of the United States of America, Brother William McKinley. The President was a guest at the residence of the Honorable William B. Plunkett, and delegations of Masons from Berkshire Lodge were invited to the Plunkett home to meet our distinguished Brother. On Monday evening May 4, 1908, at a regular meeting, the Worshipful Master announced with deep regrets the passing of our oldest Charter member, Worshipful Brother Horace M. Holmes. According to our records the jewels were draped for thirty days, as a fitting tribute to his memory. To our knowledge, no other Master Mason has ever been so honored here at Berkshire Lodge. Once again on Sunday the eighth day of October 1916, Berkshire Lodge was honored with a distinguished guest in the person of Brother William Howard Taft, President of the United States. Brother Taft accepted the invitation of our Lodge to deliver the principal address entitled “The Ethics of Citizenship” at the Masonic Night Service at the Congregational Church. Eight hundred people were present to hear this address. After the church service, Brother Taft was the guest of Berkshire Lodge at a banquet here in these apartments and was welcomed by about sixty members of Berkshire Lodge. At a Special Communication held on the nineteenth of March 1917, Worshipful Brother David D. Benson was presented the Henry Price Medal in recognition of his Masonic labors for the fifty years past The presentation was made by Worshipful Brother T. D. Brown in behalf of Berkshire Lodge. Saturday, November 24, 1917, saw Berkshire Lodge celebrate its 60th Anniversary. Visitors from all over Berkshire County joined one hundred twenty members and partook of an exceptionally fine banquet tendered by the Ladies of Franklin Chapter, Order of Eastern Star. Brother Guy A. Ham was the guest speaker and his subject, “The Contribution of Masonry to Democracy”, was well received and applauded. Berkshire Lodge annually observes a Past Masters’ Night. This night is especially to honor those Brothers among us who have worked in Lodge long and diligently and who were, by reason of their zeal and fidelity, elected to preside over Berkshire Lodge as its Worshipful Master. The first Past Masters’ Night was held in 1904, and will, we all hope, continue to be the huge success we know it to be. Over the past one hundred fifty years, Berkshire Lodge has seen one hundred and three Worshipful Masters, dedicated to Berkshire Lodge and the Fraternity as a whole. Several men leading simple lives have aspired to become leaders of our Lodge and pillars in the community. To honor those men the Henry Price Award and Joseph Warren Award have been presented to those deserving of it. In bringing this historical account of Berkshire Lodge to a close, let us leave with this sincere thought. Our Lodge has been blessed throughout its one hundred fifty years of existence with many worthy Brothers, who never in their Masonic career have lost the memory of the underlying reason, which prompted them to knock at the West Gate for admission. Berkshire Lodge celebrated its 150th anniversary in September with ceremonies that included a visit by Grand Lodge, followed by a dinner across the street at the local Elks Club. Everyone enjoyed the ceremonies in the lodge room that had standing room only. Wor. Walter L. “Mike” Bradley and Most Wor. Jeffrey B. Hodgdon sparked laughter as they poked good-natured fun, at each other’s expense, about their respective military careers in the Army and Navy. Organized in 1857, Berkshire Lodge met in many places before moving into a former church building in 1968. Every lodge has historical highlights, and Berkshire Lodge is no exception. Two Presidents — both Masons — have visited the lodge, President William McKinley in 1897 and President William Howard Taft in 1916. H. M. Holmes, S. W.
W. H. Tyler, J. W.
J. N. Dunham, S. D.
John N. Morin, J. D.
F. M. Leonard, S. S.
Saml. H. Almy, J. S.
Rev. E. T. Hunt, Chap. The fiftieth anniversary of Berkshire Lodge of Adams, Mass., was celebrated Monday, November 11th, in a manner befitting the importance of the event. Most Worshipful John Albert Blake, Grand Master, Right Worshipful Sereno D. Nickerson, Grand Secretary, and other distinguished Masons were in attendance. The public exercises were held in a church. The master of the Lodge, Worshipful Clarence E. Benson, gave an address of welcome. An historical address, of much interest, was given by Right Worshipful George H. Holden. Other addresses were by Congressman George P. Lawrence, Most Worshipful J. Albert Blake and Right Worshipful Sereno D. Nickerson. The program included vocal music by a quartet and several soloists. Previous to the exercises in the church, a banquet was served which was under the charge of the ladies, which won them many compliments. Berkshire has still living one of its charter members, Dr. Horace M. Holmes, who was present. The lodge officers are as follows: Worshipful Master, Clarence Eugene Benson; Senior Warden, Hiram E. Wilbur; Junior Warden, Dr. John E. Donovan; Treasurer, Asa S. Harrington; Secretary, Edwin K. McPeck; Senior Deacon, Henry A. Wilbur; Junior Deacon, Thomas D. Brown; Senior Steward, Melville A. Arnold; Junior Steward, Arthur W. Smith; Chaplain, Rev. Alexander B. McLeod; Marshal, Alston J. Hurd; Inside Sentinel, Peter Graham; Tyler, Robert C. Buntin; Organist, George H. Wight. The committee of arrangements was R. W. Herbert O. Hicks chairman, R. W. Robert N. Richmond, R. W. George H. Holden, P. M. Stephen L. A. Hall, P. M. John S. Adams, Asa S. Harrington, treasurer; Edwin K. McPeck, secretary. This page was last modified on 28 December 2018, at 09:10.